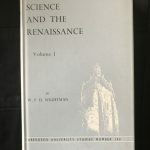 WIGHTMAN, W. P. D.. Science and the Renaissance. 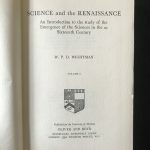 An introduction to the study of the Emergence of the Sciences in the Sixteenth Century. Edinburgh, Oliver and Boyd, 1962. 8vo. 2 vols in 4. 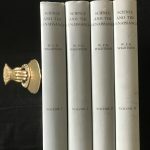 Buckram gilt, original dust jackets. First two books with illustrated upper pastedowns. An excellent copy.